Star Trek Reviewed: (211) Incomplete, abandoned (or long term hold) film projects with significant production. (211) Incomplete, abandoned (or long term hold) film projects with significant production. 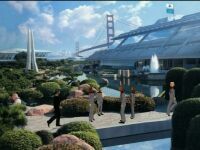 211 Star Trek (2009) or JJ Abram's "Star Trek" or Star Trek XI, has been moved to http://startrekreviewed-tvandmovies.blogspot.com/2012/01/movie-11.html . The following projects have been abandon for over a year. Some have released full episodes which end in "to be continued..." but never were. Others offer large parts of an episode (3 parts of a 4 part episode) but never finished, and have not current plans to finish. As Yorktown, A Time to Heal has proven, Never Give UP, Never Surrender! I am listing these in Alphabetical Order by Name. A remake of part of the TNG episode which introduces the Borg using dolls. This is produced by Moviestorm, a 3d animation suite. Set 5 years after the end of the Dominion War, Silver Age, Mechinima work of an adult fan. Filmmaker is Andy Price, who identifies himself as an Englishman living in Southwales. Episode 1: Ravuesian (0riginal link, dead as of 7/4/2018). http://www.moviestorm.co.uk/community/index.php?page=videos&section=view&vid_id=107488 (16:17) Still available at https://vimeo.com/29854468 (16:18) Episode is rare in that the central characters are not humans. Excellent for Mechinima. Ends, "To be continued..." Therefore, it is not a complete story. Voice actors have not responded and delayed further production of this series as of April, 2012. Some parts may be recast. On Feb. 12, 2013 I received assurance (via Facebook) that this project was still going forward, albeit slowly. In December 2013 facebook postings announced this project was going forward again. On March 21, 2015 I left a note on his Facebook page asking he had had made any progress on this film. This is a recut, but a very good one. The fan is creating a new TOS adventures by editing footage from the three seasons of TOS. He also uses clips from Star Trek:Phase II. He sets it in an alternate universe. It's not complete. An e-mail exchange in December of 2010 indicated no work is currently being done on this, but the fan still hopes to finish it. Star Trek: Imperium Silver Age. Live Action. Melbourne, Florida. Set in 2387, Silver Age, in the original time line, after Romulus is destroyed. Starting filming in January, 2010. This is their blog: http://startrekimperium.blogspot.com/ Update of website in February of 2012 notes serious and multiple personal problems which have put this on hold. Feb. 28, 2013... burst of activity on their Facebook page: https://www.facebook.com/startrek.imperium but until they report actual work, I'm leaving this here. They posted a pilot summary on May 24, 2013, but also stated they had to pay for a place to film and cameras and had no money. They want others to pay for their plans, and need a Kickstarter for over $2000.00 Still staying here. They also posted an update on May 31, 2013 here: http://forums.hiddenfrontier.com/index.php?showtopic=16448 . June 12 2013 their funding goal was not reached. No information since then. They are seeking people to help with CGI work and post-production. Episode 1 Act 1 Released February 11, 2011! http://www.youtube.com/watch?v=R4m2SyND_7I (14:10). Great acting! Star Trek: The Motion Comic. http://www.youtube.com/watch?v=hBSf6ooInJg (8:07). I am relying on the research of Orion Press in their claim this is abandon. I have not communicated with the filmmaker. However, it is a crossover film with aliens. You Tube Channel: http://www.youtube.com/user/KrazedKangaroos . TOS era. Not terrible. at least a 1. maybe a 1.5. Released Nov 2009. Ends "To Be Continued..." not finished. An e-mail from the filmmaker confirms the film may be abandon. Personal hardships and illness have meant that there are no immediate plans to finish the story. This is a Silver Age fan film set at the end of Star Trek X. They plan on producing the animated film in nine parts, of which three are available for download. Hi, the involved people on this movie are from different countries (Germany, Swiss, United Kingdom, USA, Canada). But if you want to place a single location you can use Bremen. An exchange in August 2010 claimed they had just started working on this again after putting it down for about a year. They have also posted information that they are making good progress as of Oct 1, 2010, and still expect to finish this project. On June 13, 2011, I again got confirmation that work was being done on this project. An e-mail dated February 11, 2013 informed me that the project was abandoned. Mego remake of Star Trek VI, crudely done to pass the time during a blackout.